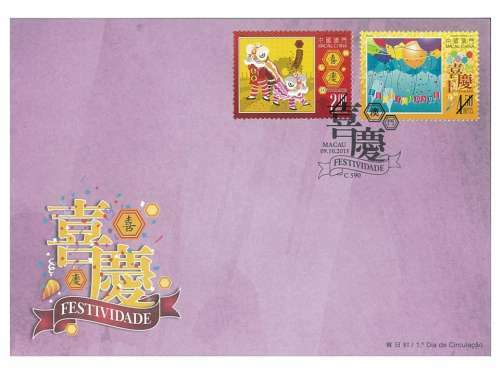 Macao Post will issue the stamp theme “Festivity” on 9th October, 2015, this issue includes a set of two commemorative stamps, the image composition integrates the characteristics of both Chinese and Western celebration, the main image of its design is the lion dance performance for celebration which is full of traditional Chinese culture, together with colourful balloon ribbons; while the colour tone of its background is red and yellow, which associates with cheerful Chinese tradition, along with light pastel purple on the stamp sheetlet. For the customers who have successfully subscribed the personalized stamps before 29/08/2015, customers can bring along the subscription receipt and I.D. 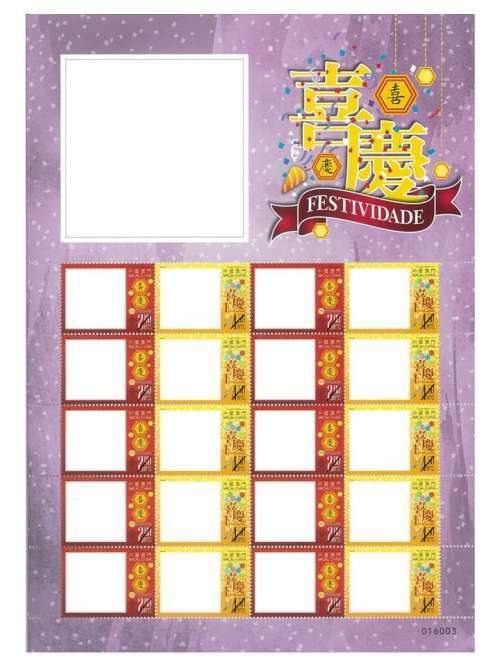 Card to the Macao Post Headquarters at the above working hour for collection on the issue day. 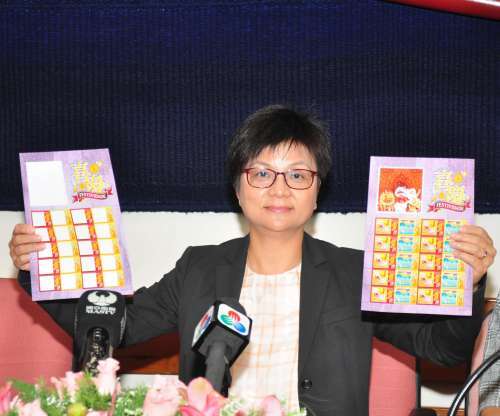 A temporary counter will be set up on 09/10/2015 to provide the subscription service for personalized stamps, the subscribed products will be available for collection at the Philatelic Shop of Macao Post Headquarters with approximately 20 working days. 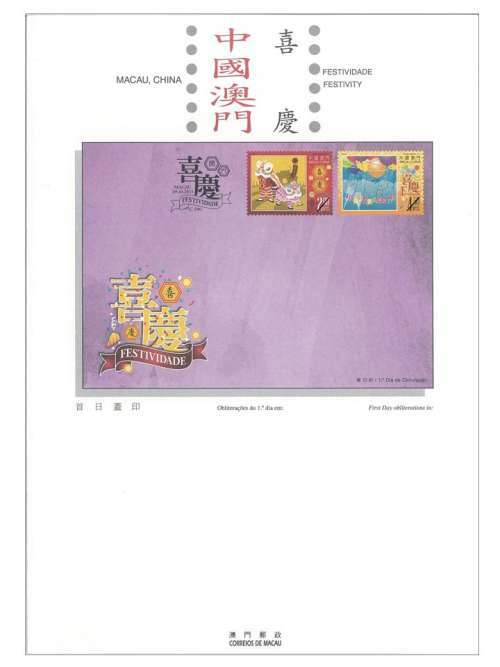 The limited quantity of First Day Cover (without stamps) will be available for sale at the Philatelic Shop of Macao Post Headquarters on the issue date, customers can produce their own First Day Cover by affixing the personalized stamps with the issue postmark for your collection or mail to your beloved friends and relatives in sharing your joyfulness. 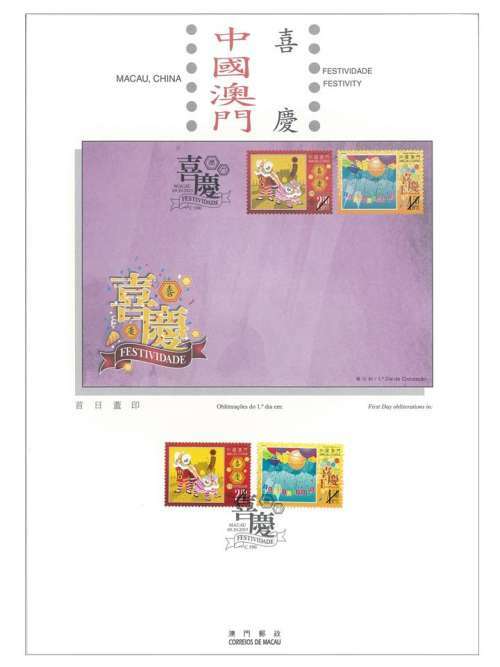 The design of this stamp issue and the text of the information brochure are responsible by Macao Post. This is the fourteenth issue in 2015. 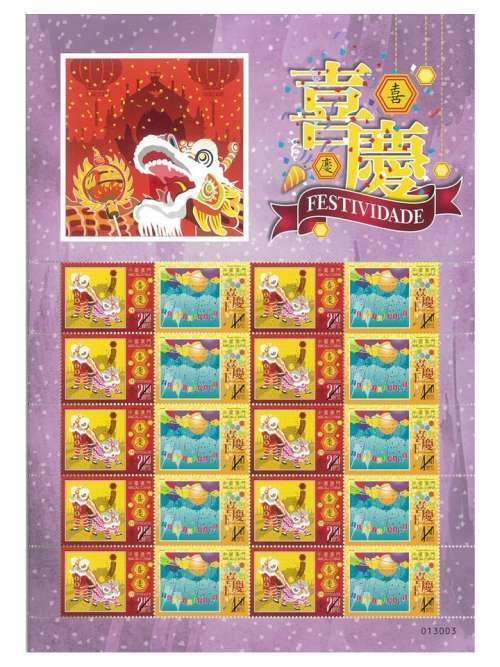 The previous issued stamps are “Lunar Year of the Goat” on 05/01/2015, the label stamp “Lunar Year of the Goat” on 28/01/2015, “110th Anniversary of Rotary International” on 16/02/2015, “Mainland Scenery VI” on 01/03/2015, “25 Years of AICEP” on 27/04/2015, “Macao Wetlands” on 05/05/2015, “110th Anniversary of the Birth of Xian Xinghai” on 13/06/2015, the label stamp “Old Streets and Alleys” on 30/06/2015, “150th Anniversary of Guia Lighthouse” on 08/07/2015, “10th Anniversary of the Historic Centre of Macao as World Heritage” on 15/07/2015, “Water and Life” on 31/07/2015, “70th Anniversary of Victory in the Chinese People’s War of Resistance Against Japan” on 03/09/2015 and the definitive stamps “Old Streets and Alleys” on 22/09/2015. 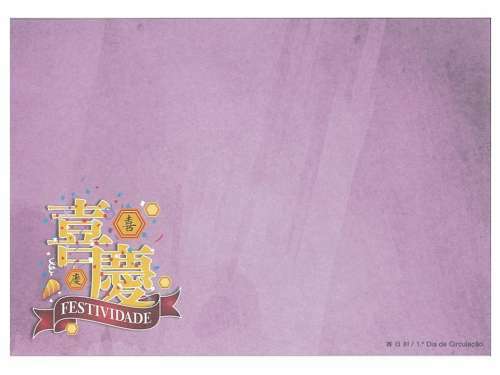 Technical Data of Stamp "Festivity"